Some types of dentures can leave you feeling a little uncomfortable. With flexible dentures this can be a thing of the past. Sometimes you may lose your teeth due to age, injury or disease. This doesn’t have to get in the way of activities such as eating and smiling. Dentures offer a great solution to restoring your smile. An added bonus of dentures is that they are not as expensive as the fixed teeth restorations. Replacing missing teeth will benefit your appearance and your health. Without support from the denture, facial muscles sag, making a person look older. A denture also will help you to eat and speak and, of course, smile. Partial dentures come in several forms. These include: cast metal, flexible and acrylic. The flexible partial is made from a special material that gives the wearer added comfort and fit. Flexible dentures receive their name due to their flexible base: The flexible base of the appliance adapts to the constant movement and flexibility in the mouth. They are also less conspicuous compared to the other types of partial dentures due to the materials from which they are made. Flexible partial dentures are custom fabricated in a dental laboratory according to the specifications your dentist provides. Due to the fact that there are no metal clasps in the composition of these dentures, they are virtually invisible and blend in with the natural colour of the gums in your mouth, making them significantly less noticeable. Taking good care of your flexible partial dentures will ensure that they are in tip top shape and will also extend their life. Speak to Rod at Dentures At Clayfield about the most suitable products that you can use to clean your flexible dentures as some products are not suitable for this type of denture. If you have lost teeth and are looking for an affordable, comfortable and unnoticeable restoration method; flexible dentures may be just what you are looking for! Book a consultation with our team at Dentures at Clayfield today by giving us a call on (07) 3862 2256. Do all denture practices offer flexible dentures? Unfortunately, not. However, more and more practices are beginning to adopt flexible dentures due to their increasing popularity. Book a consultation to find out if you are eligible or not for flexible dentures. Can I use standard shop bought denture cleaners on my flexible denture? This is something that you will need to discuss with your dental prosthetist as it does depend on what brand of flexible denture is being used. 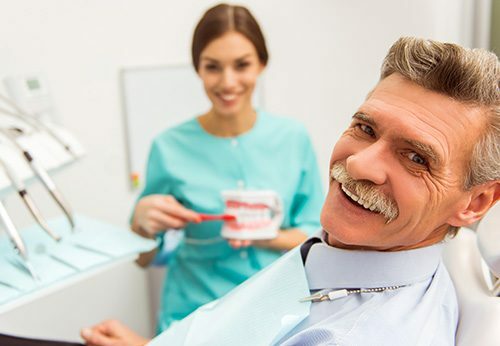 Your dental prosthetist will be able to give you a clear breakdown of which products will be best suited to cleaning your particular denture.